My recently acquired 1998 M3 Sedan was in pretty good condition, but still showed some scars of its life up north, mainly in rusted hardware. 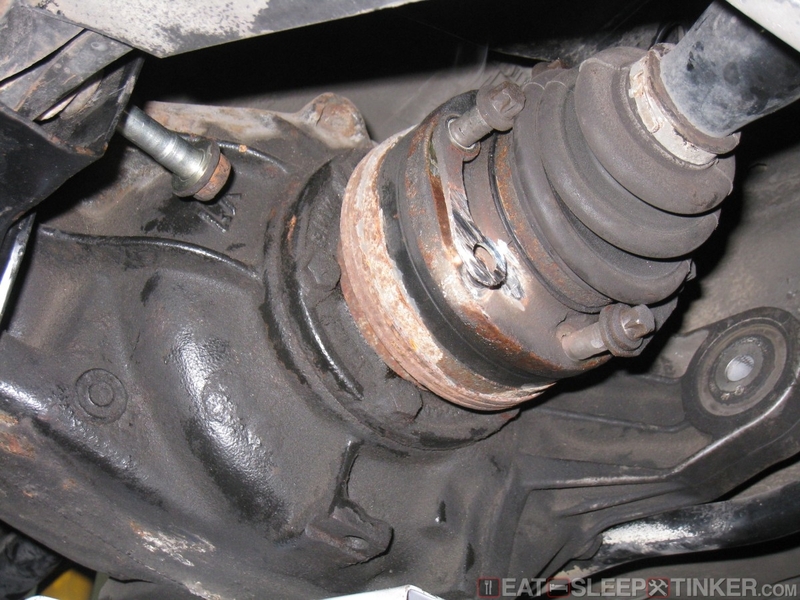 The pre-previous owner had commissioned TC Kline to overhaul the majority of the suspension, including replacing the rear subframe with a less rusty one. They had also replaced the subframe bushings with new OEM ones, but little else. 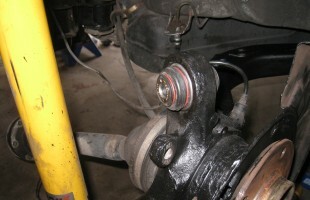 From what I could gather, all the control arm bushings and ball joints were still original. The parking brake was also not doing anything to keep the car in one spot, and the shifter was a bit sloppy. So up she went on jack stands for a good overhaul. I began removing everything from the rear of the car. I quickly ran into issues when the bolts for the lower camber arms refused to come out of the ball joints located on the rear trailing arms. Both sides were rusted in solid, and no amount of PB Blaster or blows from a hammer would release them. This isn’t that uncommon of an issue, and the only option is to cut the bolts. Fortunately the inboards and uppers, despite plenty of rust, came out without much fuss. Then I ran into more problems, as a couple of the Torx head bolts that attach the stub axles to the differential had been rounded off at some point. Again: cut them off. I had to use an electric angle grinder to get these off, which also cut a bit into the reinforcement plates. Eventually I got all the bolts out and was able to drop the differential. Why drop the differential you ask? 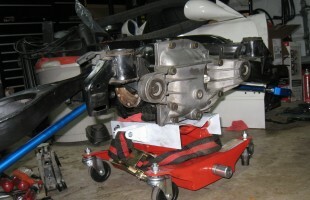 Well, in a stroke of somewhat poor design, you must lower the differential to completely remove the inboard bolts for the upper and lower control arms. 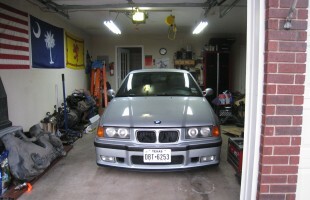 See this all started with me simply wanting to replace the lower flimsy OEMarms with adjustable Turner Motorsport arms. 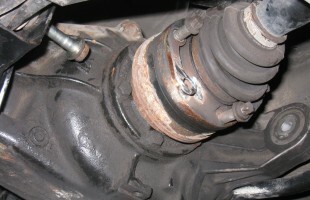 Further issues arose during the process of removing the anti-sway bar, with the nut attaching one of the links snapping completely off with the bolt threads still attached. The rust had crept worse than I had imagined, and penetrating oil was only helping so much. Now back to those stuck ball joints. With the bolts removed, I now needed to press them out. 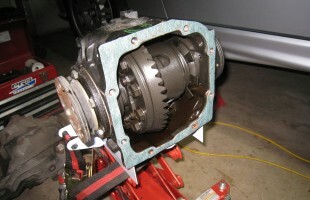 In order to gain enough access this requires removal of the parking brake and loosening of the dust shield / backing plate (complete removal requires pulling the hubs.) I then scrounged up a few pieces of exhaust tubing that would fit on the outer edge of the ball-joints. I fashioned up a simple puller/press tool with some threaded rod, nuts, and washers from the local hardware store. I’m sure there are much better suited tools (which I purchased and arrived after I was done) but this simple homemade contraption did work. 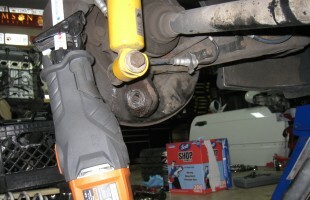 I also rented a balljoint press tool from Autozone, but found it difficult to use given the space provided. 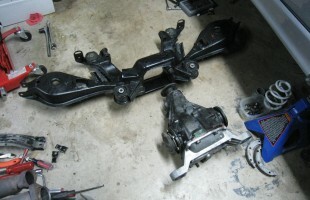 It also didn’t have properly sized cups to fit the joints or against the trailing arm’s casting. While all the hardware was removed, I cleaned it thoroughly and let it soak for several days in containers full of Evapo-Rust. 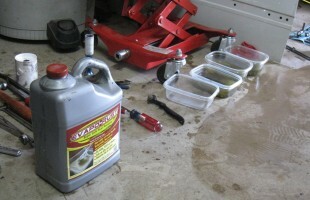 You can purchase this stuff from most any auto parts store and it works as advertised, surprise! Several of the heavily rusted items required a few goes with the wire brush and additional soaks, but it eventually ate away all of the rust. 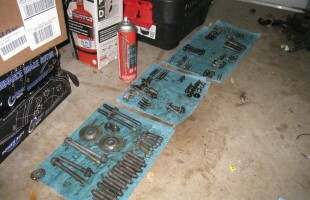 I then washed and dried the hardware and gave everything a coat of CorrosionX, a product similar to Cosmoline. 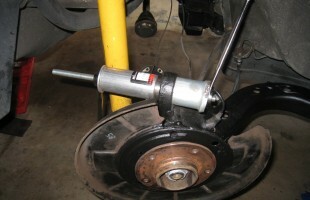 I also refurbished the upper control arms, painting them with black Rust Encapsulator and pressing in new OEM bushings. Getting these bushings in and out also presented quite the challenge. 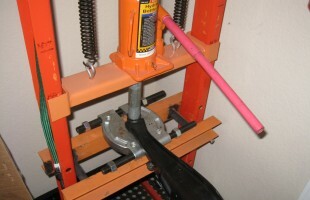 Since the parts are made from thin steel, it is very difficult to get a “ledge” to rest either a puller or use with the press. I ended up using my hydraulic shop press and a combination of sockets, pipes, and random tools to get the old bushings out and the new ones in (though I may have destroyed at least one in the process. Rather than slap the old 3.23 ratio LSD back in the car, I decided for a bit of an upgrade while I had everything apart. I happened to have a spare 3.38 LSD from an automatic M3 which I no longer had a use for, it also had less mileage on it. It’s not a huge difference going from a 3.23 to a 3.38, but then again this is a daily driver and I didn’t want excessive revs while cruising at highway speeds. I cleaned up the inside of the case, squirted on a little Toyota FIPG and a new OEM gasket with the cover and was good to go. Now in the photo above you can see me trying to install the entire subframe with the differential installed, this ended up not working at all. 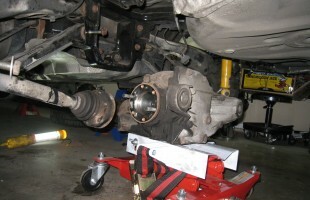 The issue is that you have contort everything in such a way to get around the stub axles that it makes it impossible. Now if the trailing arms (w/axles) had been removed and installed to the subframe, then yes you could probably get it all up as one unit. I didn’t want to do this, as it involves losing the toe settings. So in the end I had to re-remove the differential from the subframe, then install the subframe, then finally fish the differential back into place. The anti-sway bar (which I had replaced with one of my spares) goes on last. It’s a bit tight with the spare tire well taking up valuable room, but I managed by myself. The simple scissor-style transmission jack I have comes in very handy for this type of job. Though I didn’t get any pictures, I also rebuilt the parking brake. I say rebuilt, but really it was just a lot of rust removal and reassembly. I gave the backing plate a good coat of Rust Encapsulator as well. Then greased the threads of the shoe adjusters before reassembling everything, following the Bentley guide for adjustment procedures. With everything back together, properly corrosion-proof, I have good reassurance that this car will be on the road for another 122,000 miles. The pretty blue anodized Turner control arms provide added alignment adjustment possibilities, allowing for much more precise camber settings.